The world is changing. There’s no way around this fact. The Fourth Industrial Revolution is now. And, whether you know it or not, it will affect you. Billions of people and countless machines are connected to each other. Through groundbreaking technology, unprecedented processing power and speed, and massive storage capacity, data is being collected and harnessed like never before. Automation, machine learning, mobile computing and artificial intelligence — these are no longer futuristic concepts, they are our reality. To many people, these changes are scary. Previous industrial revolutions have shown us that if companies and industries don’t adapt with new technology, they struggle. Worse, they fail. But I strongly believe that these innovations will make industry – and the world – stronger and better. The change brought by the Fourth Industrial Revolution is inevitable, not optional. And the possible rewards are staggering: heightened standards of living; enhanced safety and security; and greatly increased human capacity. For people, there must be a shift in mindset. As difficult as it may be, the future of work looks very different from the past. I believe people with grit, creativity and entrepreneurial spirit will embrace this future, rather than cling to the status quo. People can be better at their jobs with the technology of today—and the technology that is yet to come—rather than fearing that their human skills will be devalued. We have all heard the stories about computers beating even the greatest grandmasters. But the story is more nuanced; humans and computers play differently and each has strengths and weaknesses. Computers prefer to retreat, but they can store massive amounts of data and are unbiased in their decision-making. Humans can be more stubborn, but also can read their opponent’s weaknesses, evaluate complex patterns, and make creative and strategic decisions to win. Even the creators of artificial chess-playing machines acknowledge that the best chess player is actually a team of both human and machine. 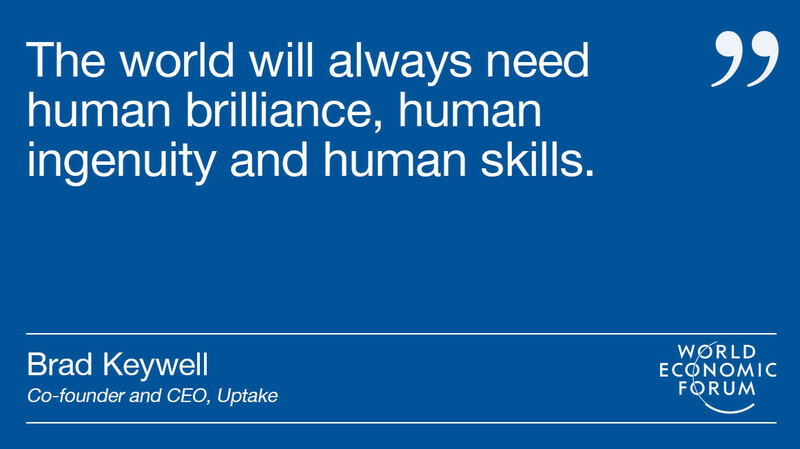 The world will always need human brilliance, human ingenuity and human skills. Software and technology have the potential to empower people to a far greater degree than in the past—unlocking the latent creativity, perception and imagination of human beings at every level of every organization. This shift will enable workers on the front line, on the road and in the field to make smarter decisions, solve tougher problems and do their jobs better. This is our mission at Uptake—to combine the power of data and the power of people, across global industries. Railroad locomotives are powered by massive, highly complex electrical engines that cost millions of dollars. When one breaks down, the railroad loses thousands more for every hour it’s out of service (not to mention, there are a lot of angry travellers or cargo customers to deal with). After the locomotive is towed in for repairs, technicians normally start by running diagnostic tests. These can take hours, and often require technicians to stand next to roaring engines jotting down numbers based on the diagnostic readings. That’s the old way – or, at least, it should be. When locomotives operated by our customers roll into the shop for routine services, all diagnostics have already been run. Our software has forecast when, why and how the machine is likely to break down using predictive analytics — algorithms that analyze massive amounts of data generated by the 250 sensors on each locomotive. Our systems have examined that data within the context of similar machines, subject- matter experts, industry norms and even weather. If there’s a problem, we detect it, and direct the locomotive to a repair facility. A mechanic can then simply pick up an iPad, and learn in a few minutes exactly what is about to break down, as well as the machine’s history and the conditions it’s been operating under. That leaves the mechanics to do what they do best: fix it, using their experience, judgement and skill. And the mechanics decisions and actions become data that feeds back into the software, improving the analytics and predictions for the next problem. So, technology didn’t replace mechanics; it empowered them to do their job. In the same way that chess masters and computers work best together, the mechanic used human skills that a machine can’t replicate: ingenuity, creativity and experience. And the technology detected a problem that was unknown and unseen to human eyes. In short, when the mechanic and the technology work together, the work gets done faster, with fewer errors and better results. Multiply this across all industries: aviation, energy, transportation, smart cities, manufacturing, natural resources, and construction. The productivity we unleash could be reminiscent of what the world saw at the advent of the first industrial revolution. But the impact of the Fourth Industrial Revolution will run much broader, and deeper, than the first. We’ll have the knowledge, the talent and the tools to solve some of the world’s biggest problems: hunger, climate change, disease. Machines will supply us with the insight and the perspective we need to reach those solutions. But they won’t supply the judgement or the ingenuity. People will.